"The North... rugged mountains and dense forests, which hide many beings hostile to man (who has settled here but lightly). Many dungeons and ruins also lie hidden in the Northern wastes, relics of the former splendor of the dwarven kingdoms, now lost and abandoned, and of earlier, fallen kingdoms of men. "Waterdeep...crossroads of the world, City of Splendors. Here and wealth and goods from every corner of the Realms, intrigue and feuds and important personages of rank and influence. From the many-spired towers of Piergeiron's Palace to the living, ever-changing city of Waterdeep, and suggests many adventures therein. "Partake of the sights, the bustle, and the intrigue -- rub shoulders with the powerful and famous -- feast your eyes on fabled treasures. Hear tales in the taverns such as can be heard nowhere else in all the world -- but keep your weapons ready and your wits sharp. Oh, and above all... enjoy your stay." "It is called the City of Splendors: Waterdeep, most populous and powerful of the cities of the North. It is a city of wealth, adventure, and danger. More men have died in its taprooms and bars than in all the seiges of Dragonspear Castle. Success and death lurk in its shadowed entranceways and dimly-lit streets. Come explore the greatest city of the Realms in this incredible new boxes set dealing with urban fantasy adventures. Waterdeep is detailed in no less than 10 expanded maps, embellished with typical building interiors suitable for use in any campaign setting. 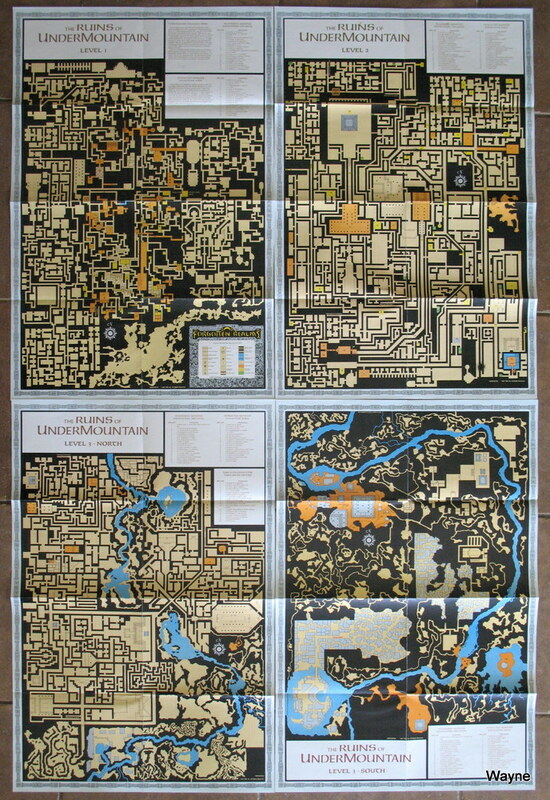 In addition, a full-size poster of Waterdeep is provided, along with a grand-scale three-dimensional map of Castle Waterdeep, hub of the city's government. In addition to all these maps, a 32-page City System booklet provides encounters and street scenes, special features and details of Waterdeep, and methods for creating types of buildings in moments and filling the pockets of those unfortunate enough to get in a player character's way. Designed for use with Waterdeep, these new features are suitable for use anywhere in the Forgotten Realms!" 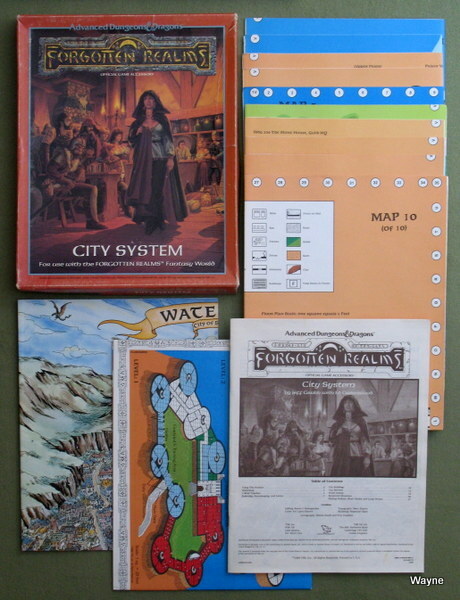 I consider the Forgotten Realms City System set to be an underappreciated gem. It's difficult to grasp the size this map set. 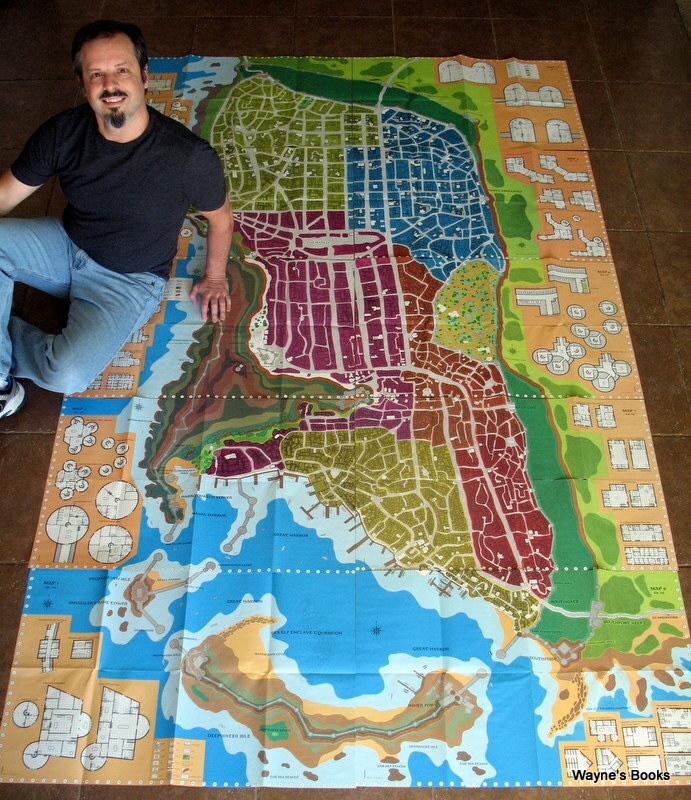 Here's a photo of me with the 10 maps of Waterdeep put together. 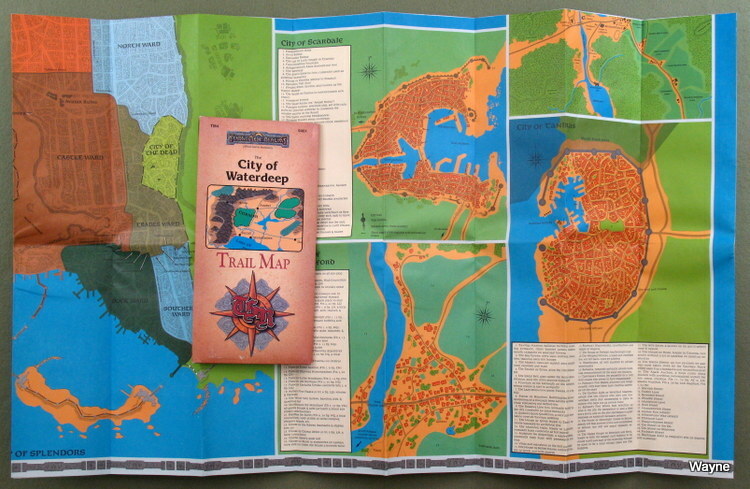 The set also has (not shown here) a smaller overall map of the city, a 32-page guidebook, and a poster with an artist's rendering: An aerial view of the city. This trail map's title is a bit misleading, as Waterdeep only occupies a small portion of the map. The entire Forgotten Realms continental setting is mapped out, as well as major cities. "A fantasy city can be a vast, sprawling, mazelike place. Main streets turn into blind alleys. Thriving markets adjoin crime-infested slums. The wise traveler avoids problems by consulting his Trail Map. TM4 maps out not only the grand city of Waterdeep, but also to other cities featured in the Avatar trilogy: Shadowdale, fabled home of Elminster the Sage, and Tantras, a bustling port on the Dragon Reach. All maps are full color, printed on a 36" by 57" sheets suitable for use in gaming or as a wall poster." 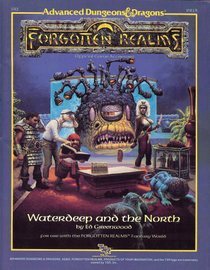 "You hold in your hands an amusing and insightful guide to Waterdeep - the metropolis of the North, the City of Splendors. 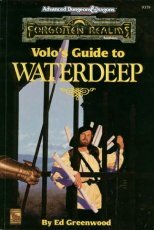 This handy pouch-sized tome presents Volo's choice of the finest, most spectacular, and least known (but most desired) information about the people, customs, and locations in Waterdeep - ranked with a handy coin, dagger, pipe, and tankard ratings system. The best places to dine, stay, see -- and, of course, avoid! "Special note: This edition of Volo's Guide to Waterdeep, intended for travelers from beyond the borders of Faerun, contains notes and commentary by the famous archmage and sage Elminster." Come explore the greatest city of the Realms in this compilation of everything about the City of Splendors. From the spires of Piergeiron's Palace to the depths of Undermountain, this city's sure to thrill players and Dungeon Masters alike for years." 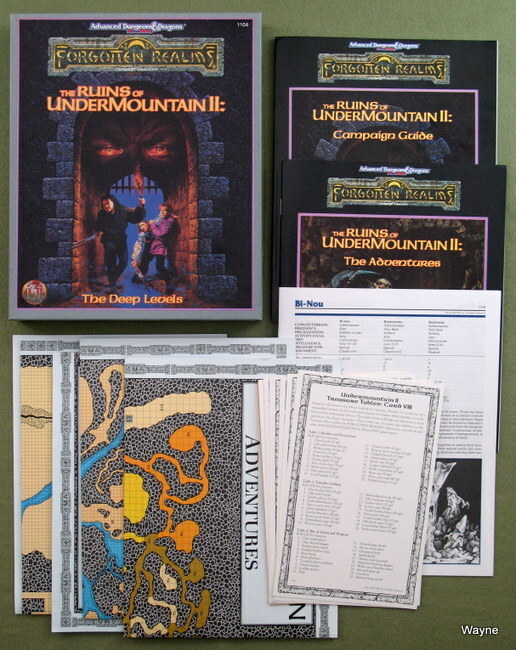 The classic Undermountain set was originally released in 1991 in the 1 1/4"-deep box style that TSR had been using for years. In 1993, they re-published the set in the 1 3/4"-deep box that they had begun to favor at the time. Other than trivial formatting changes, the contents of the two sets are identical. 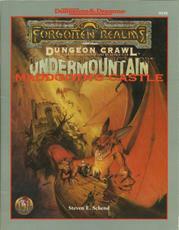 "UNDERMOUNTAIN awaits you: the fabled and feared battleground of the Realms - "The Deepest Dungeon Of Them All." DARE YOU FACE...miles upon miles of deadly traps, glittering treasures, strange and cryptic rooms, and slithering, skulking, lurking monsters? They await you underneath Waterdeep! It's just the setting for long-running, memorable, great AD&D game play, the perfect locale you'll never forget. So please, come in. Mind your step among the skulls. Oh, yes - good luck - you'll be needing it." 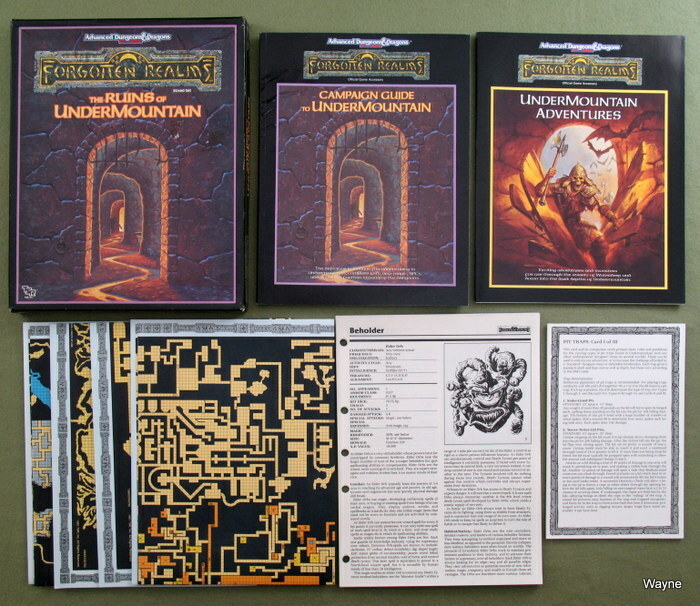 "This sequel to The RUINS OF UNDERMOUNTAIN contains the 128-page Campaign Guide to Undermountain: The Deep Levels, a 32-page adventure booklet, a 16-page MONSTROUS COMPENDIUM booklet, four full-color, poster-size maps of the levels described in this boxed set, and a set of eight DM Assistance Cards to aid in trapping the corridors and rooms of this, the greatest and most dangerous dungeon in all the Realms. The original campaign expansion set wasn't enough? 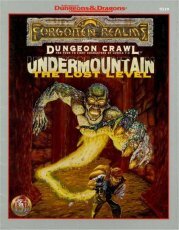 Well, then, pack your gear and delve into Ruins of Undermountain II: The Deep Levels. The deep-dwellers await!" This DUNGEON CRAWL adventure includes 32 pages of combat and role-playing hearkening back to classic AD&D dungeons of old. This is a stand-alone module and does not require additional support materials. It can easily be inserted into a campaign on any world, but best fits an Undermountain or Waterdeep campaign within the Realms." "'Ye want this ol' moneylender's advice on entering Halaster's Hall yet again? My advice is this: Don't. There's precious few treasures worth the death and agony and fear you'll face. Your problems are twofold: First, ye've walked its halls before, and Halaster pays attention to those who visit him frequently (and he's the one you don't want to have watching you!). Second, you're looking for the lair of that lunatic wizard-murderer from Trades Ward. He's a dangerous lot, that Maddgoth, and many other met their ends by underestimating that pasty-faced little scarecrow. If you're looking to lay siege to Maddgoth's Castle, you're on your own. I've not visited it, and I'm not likely to, either. Truth be told, no adventurer I've heard of looked for Maddgoth's lair and returned to tell of it. This DUNGEON CRAWL adventure returns once again to the hallowed halls of Undermountain and into an adventure like those AD&D game archetypes of years past. This is a stand-alone module and does not require extra support materials. It can be placed easily into a campaign on any AD&D world, but best fits a FORGOTTEN REALMS campaign set in Undermountain or Waterdeep." 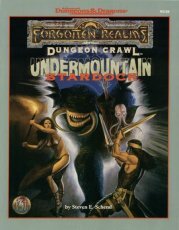 This DUNGEON CRAWL adventure returns once more to the hallowed halls of Undermountain, but it's a different day. At dawn of Highharvestide 1369, every practitioner of magic on the Sword Coast knew there was a problem. By midmorning, the Lords of Waterdeep confirmed the ill omens: Some brave souls worthy of the title 'Hero' must enter Undermountain on a mission to save Halaster Blackcloak! Could these heroes be your group of player characters? This is a stand-alone module and does not require extra support materials. It can be placed into a campaign on any AD&D world, but best fits and impacts a FORGOTTEN REALMS campaign set in Undermountain or Waterdeep." "Skullport, the Port of Shadow, is perhaps the best kept secret in all the Sword Coast North. A mile and a half beneath the orderly streets of Waterdeep squats the most wretched and lawless pits of thieves, buccaneers, slavers, and sellswords the Realms has to offer. Under a moldering tangle of catwalks threaded between the stalactites and stalagmites of the cavern city, illithids, drow, beholders, and others plot and trade with emissaries from the surface. Monsters prowl the dark recesses and alleyways, gangs of zombies shamble about performing menial labor, and anything and everything can be bought and sold: lethal poisons, foul tomes of forbidden magic, and slaves. The only law is meted out by the enigmatic Skulls of Skullport, mysterious floating humanoid skulls whose capricious judgments and madness-induced destructiveness are the stuff of grisly travelers' tales. Gold rules the ever-present twilight, and only those with keen eyes and blades may keep it long. • Maps and general information about the three layers and four wards of Skullport. • Descriptions of over 100 notable sites in the wards. • A partial map of the dungeons of Skullport -- where the Skulls throw the folk they let live! • Descriptions of notable NPCs and power groups of Skullport. 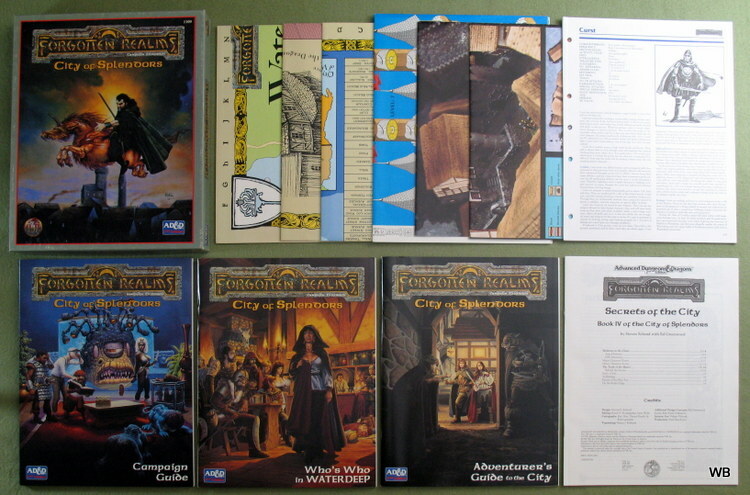 Although no other FORGOTTEN REALMS setting products are required to use Skullport, this accessory can be used to provide supplemental information for the Ruins of Undermountain campaign expansion. 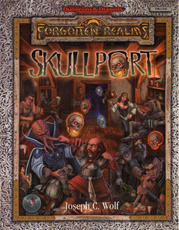 Dungeon Masters can also use SKullport as a basis for an UNDERDARK city in their own campaigns."